The An-225 first flew on 21 December 1988. The aircraft was on static display at the Paris Air Show in 1989. Two aircraft were ordered, but only one An-225 (tail number UR-82060) is currently in service. It is commercially available for carrying ultra-heavy and oversize freight, up to 250,000 kg (550,000 lb) internally or 200,000 kg (440,000 lb) on the upper fuselage. Cargo on the upper fuselage can be 70 m long. 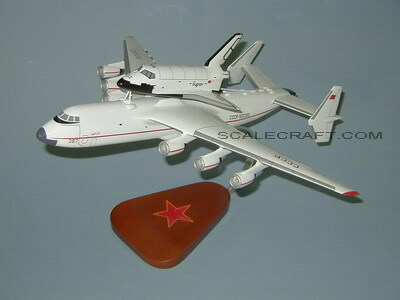 A second An-225 was partially built during the late 1980s for use by the Soviet space program. Following the collapse of the Soviet Union in 1990 and the cancellation of the Buran space program, the lone operational An-225 was placed in storage. The six Ivchenko Progress engines were removed for use on An-124s, and the second An-225 airframe (nearing completion and awaiting engines) was also mothballed. Mahogany wood. Wingspan 18 inches, Length 17 1/2 inches.